The world is a very big place, and it has an extensive history. Although there is plenty of beauty on our planet, there are certain things that are so incredible that they have been dubbed “wonders of the world”. These wonders are often culturally and historically significant, they’re massive tourist attractions, and they’re typically considered iconic. What are some of the most impressive wonders of the world? 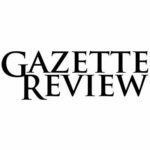 In this article, I’m going to be going through what I believe to be the top ten wonders of the world. Although the ordering of this list is obviously subjective, I don’t think that the magnitude of any of these wonders can be doubted. Without further ado, let’s get right into this. We begin our list of the top 10 wonders of the world with St. Basil’s Cathedral, which is also known as the Cathedral of Vasily the Blessed. It is one of the more iconic Russian landmarks of all time. This Russian Orthodox cathedral is located in Moscow, Russia, and it was built in 1555, during the reign of Ivan the Terrible. It was consecrated in 1561, when construction had completed. This architectural marvel was designed by Barma and Postnik Yakovlev, and it’s meant to be shaped like a flaming bonfire as commemoration of Russia’s capture of Kazan and Astrakhan. Due to the Soviet Union’s push for state atheism during the early 1900’s, St. Basil’s Cathedral was secularized. It isn’t a cathedral anymore, and it’s not officially known as the Cathedral of the Intercession of the Most Holy Theotokos on the Moat, and it’s more of a museum. Petra is the name of a historical city located in modern-day Jordan. It is probably the biggest tourist attraction in all of Jordan, and many people consider it to be one of the modern wonders of the world. Petra was originally known as Raqmu by its inhabitants, the Nabataeans. The Nabatataeans were a nomadic Arab people who used Raqmu as their capital city. Petra is truly an architectural and historical marvel, largely due to its rock-cut architecture. 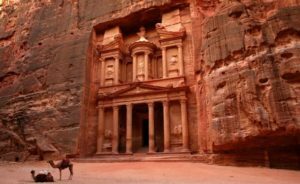 Many of the “buildings:” that can be found in Petra are carved directly into the stone, which is obviously something to behold, especially at Petra’s scale. The world was able to learn of the existence of Petra thanks to Johann Ludwig Burckhardt, a Swiss explorer who introduced it to the public in 1812. Petra could have been built as early as the 5th century BC, but it still holds up today. Speaking of ancient ruins, Machu Picchu is arguably one of the most well-known ancient ruins of all time. This Inca citadel is located in the Cuzco Region in modern-day Peru, and it stands 7,970 feet above sea level. 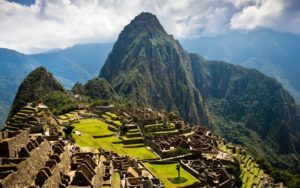 Although the exact original use of Machu Picchu is unknown, most historians think that it was originally meant to be an estate for Pachacuti, the Inca emperor. It is estimated that it was built in 1450, but it was abandoned by the Incas during the Spanish Conquest. The three main components of Machu Picchu are the Inti Watana (a ritual stone), the Temple of the Sun, and the Room of the Three Windows. This classical Inca site wasn’t in the best shape when it was first brought to public attention in 1911, but it has been the center of diligent restoration efforts for decades. Christ the Redeemer, known as Cristo Redentor by locals, is the famous statue of Jesus Christ located in Rio de Janeiro, Brazil. This symbol of Christianity is largely considered the most iconic fixture in all of Rio de Janeiro, and in all of Brazil as a whole. This is a bit newer than some of the other wonders on this list, as this Art Deco statue was officially completed in 1931. This statue was a collaborate effort by many, created by Paul Landowski, a Frenchman, and built by Heitor da Silva Costa Brazil. 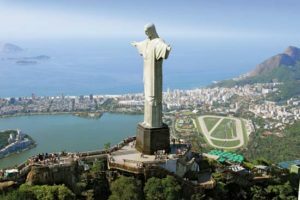 Christ the Redeemer is massive, standing 98 feet tall and standing atop a 26 foot pedestal. It seems even larger when you consider that it’s located at the peak of the Corcovado mountain, which overlooks Rio de Janeiro. This wonder is built out of reinforced concrete and soapstone, weighing a whopping 635 metric tons. 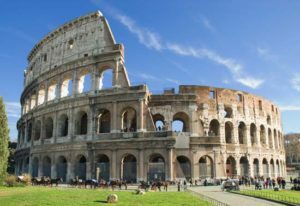 Whether you know it as the Colosseum or as the Flavian Amphitheatre, this fixture is probably the most famous remnant of Ancient Roman civilization. This massive amphitheater is located right in the center of Rome, Italy, east of the also famous Roman Forum. It has been estimated that the Colosseum was constructed sometime between 70 and 80 AD. The Colosseum was originally constructed during the Flavian dynasty, under emperors Vespasian and Titus, and it was used for all sorts of public spectacles including gladiatorial contests, dramas, and even executions. It has been estimated that the Flavian Amphitheatre could have held up to 80,000 people during its prime. Although the Colosseum has been damaged by earthquakes and stone robbers over the years, it is still remarkably well-preserved, and an icon of Roman culture. While the Colosseum celebrates Ancient Roman society, the Sistine Chapel celebrates Renaissance Italy. This icon chapel serves as the official residence of the Pope, located right in the heart of Vatican City. It was consecrated way back in 1483, and it has quite the storied history. Its architects consist of Baccio Pontelli and Giovanin de Dolci, and an extensive list of renowned Renaissance painters contributed to the many frescoes that adorn its interior. The painters, which included Sandro Botticelli, Pietro Perugino, Cosimo Roselli, and Domenico Ghirlandaio, completed their work in the Sistine Chapel in around 1482. One of the more famous aspects of the Sistine Chapel is its gorgeous ceiling, which was painted by Michelangelo between 1508 and 1512. 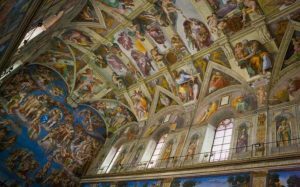 The Sistine Chapel is a unique wonder of the world, because it holds religious, cultural, and historic significance. 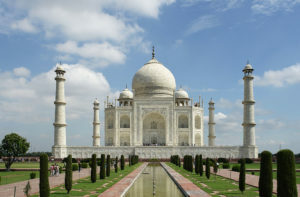 The next item on this list of the top 10 wonders of the world is the Taj Mahal, which translates to Crown of the Palace, which is located in Uttar Pradesh, India. The Taj Mahal is certainly an iconic Indian monument, but not everyone knows that this so-called palace is actually a mausoleum. This architectural marvel was built sometime between 1632 and 1653, comissioned by Shah Jahan, the Mughal emperor. He wanted the palace built to serve as a tomb for Mumtaz Mahal, who was his favorite wife. At the time of its construction, the Taj Mahal would have cost the modern equivalent of about $827 million. Around 20,000 artisans helped to contribute to its construction. Today, the Taj Mahal is considered one of the modern wonders of the world, and it’s without a doubt one of the largest tourist attractions in all of Italy. Speaking of tourist attractions, there may not be a tourist attraction more renowned than the Eiffel Tower, located in Paris, France. The team behind this tower include Stephen Sauvestre, Maurice Koechlin, and Emile Nouguier. It was largely financed by a contracting company owned by Gustave Eiffel, which is why it’s called the Eiffel Tower. It was originally constructed as an entrance the 1889 World’s Fair, but it has since become an icon of France as a whole. At the time of its construction, it was the tallest man-made structure in the entire world. However, once the Chrysler Building was made in 1930, it lost that title. 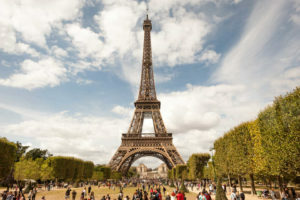 Even still, the Eiffel Tower is still the tallest structure in all of Paris. It is also considered the most-visited monument in the entire world. When people think of France, they often think of the Eiffel Tower. A lot of the wonders that I’ve mentioned thus far are pretty fanciful in nature. The Great Wall of China is a unique wonder of the world, then, because it has served a key tactical purpose in China for many years. The Great Wall is, well, a wall. It’s primarily built of stone, brick, and wood, and it spans the historic northern borders of the country. The wall has been constructed, improved, and lengthened over many years and across many dynasties. As you can imagine, it would have been impossible for this empire to have constructed a 13,171 mile long wall under a single emperor. 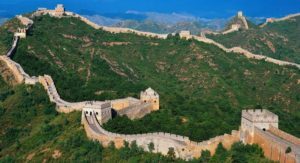 Aside from being beautiful, the great wall was also used as a form of border control. It allowed China to protect itself from invasions and raids. Although the myth that the Great Wall of China can be seen from space is untrue, it cannot be denied that this is one of the most historically significant feats that the world has ever seen. Speaking of historically significant feats, I don’t think that any construction is more impressive than the construction of the Great Pyramid of Giza. This pyramid is the last remaining survivor among the original ancient seven wonders of the world. 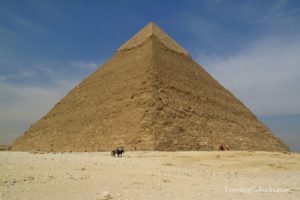 This pyramid is the largest of the three pyramids in the Giza pyramid complex, and at 481 feet, it stood as the largest man-made structure in the world for literally thousands of years. Although people today now know this pyramid as looking sort of like a giant staircase, it was originally covered in stones that gave it a smooth surface. Historians suspect that the Great Pyramid of Giza was originally made as a tomb. 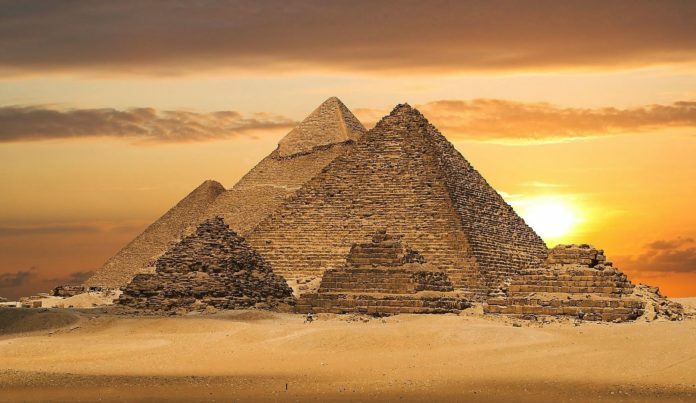 It is estimated that the pyramid was constructed sometime between 2580 BC and 2560 BC, as it was constructed under fourth dynasty Pharaoh Khufu. The details behind the construction of this pyramid are still a mystery, but most people believe that it was either made by an army of slaves or an army of skilled laborers. Without a doubt, the sheer scale of this achievement is the most impressive in the world.